Yealink’s not a brand you normally associate with Lync and the corporate end of town, but perhaps as an indicator of the strength of the Lync brand they’ve thrown their hat into the ring and released two phone models with firmware for Lync. I managed to get my mitts on the high-end “T48G” and thought I’d take it for a spin. Out of the box it looks quite a respectable piece of kit, albeit perhaps a little large at 26.5cm/10.5” wide. The desk stand only has the one position, but that seemed to work for me. I was surprised to find that the angle of the display isn’t adjustable. The look of it, with a gloss surround set into a matt phone body screamed “adjust me”, but alas it was for nought. 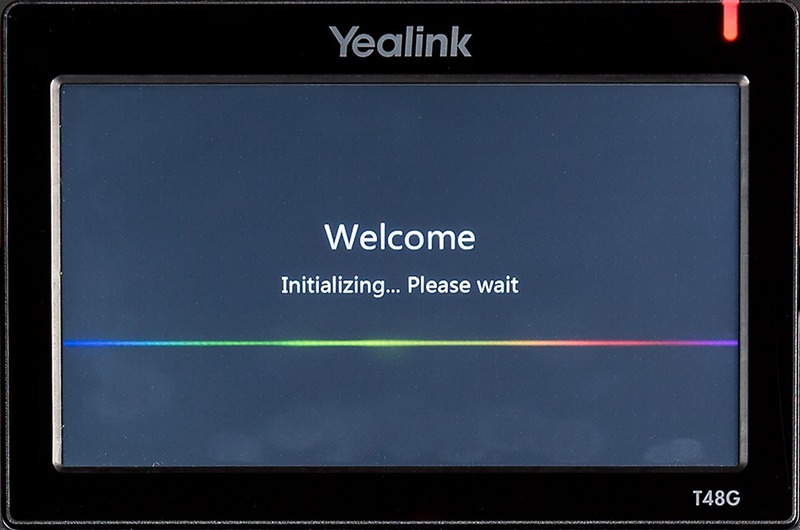 With power applied we see a colourful splash screen for over a minute before it prompts for a login. If the phone has lost connectivity while you’ve previously been logged-in it will power up and log you in automatically. You have the option of PIN-based login or providing full credentials, complete with an on-screen touch QWERTY keyboard we’ve not seen since the Tanjay. At the bottom of the screen is the main menu, with four options: Favorites, History, Contacts and Menu. The clock is prominent in the centre, and tapping the photo at the top right presents a menu to change your status or sign out. 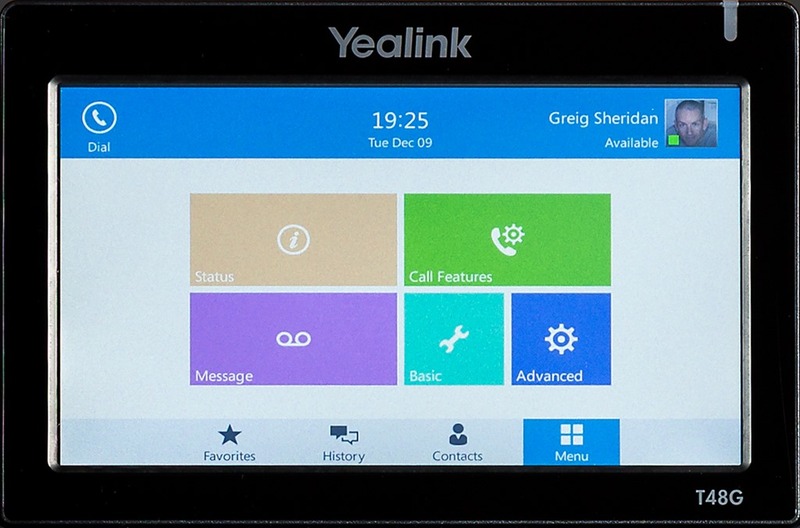 The phone can be customised from its in-built web-server, via the on-screen menu or a separate provisioning server. Out of the box it’s serving pages on both http and https and it was a doddle to ask the phone its IP address and then login via the browser (admin/admin BTW). I was a little annoyed (but at the same time reassured) that in the process of preparing this review I left the web interface alone long enough for it to time me out and require re-authentication. 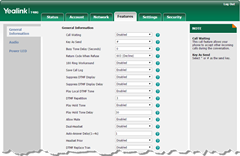 Both admin interfaces are well laid out and easy to use. The web interface has a “?” icon next to just about every parameter and whilst some aren’t all that forthcoming with help text, it’s better than nothing. Some features you can enable and disable from the phone whilst others you can only control via the browser. 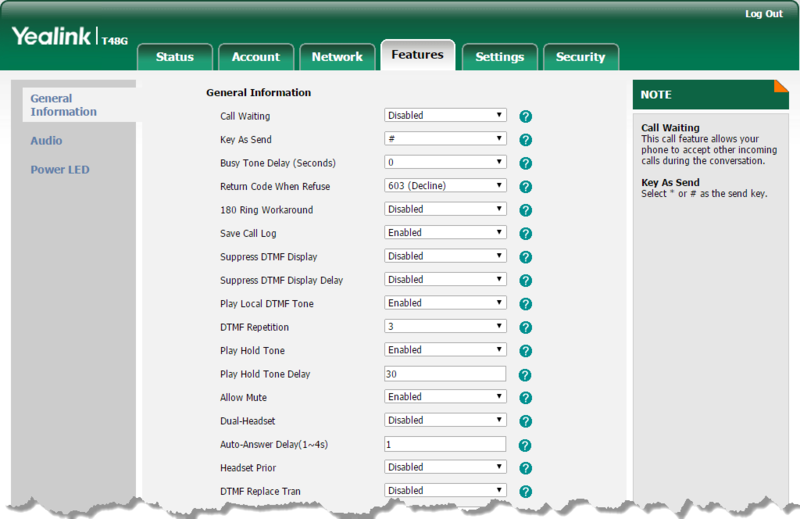 Two examples are call waiting and auto-answer. 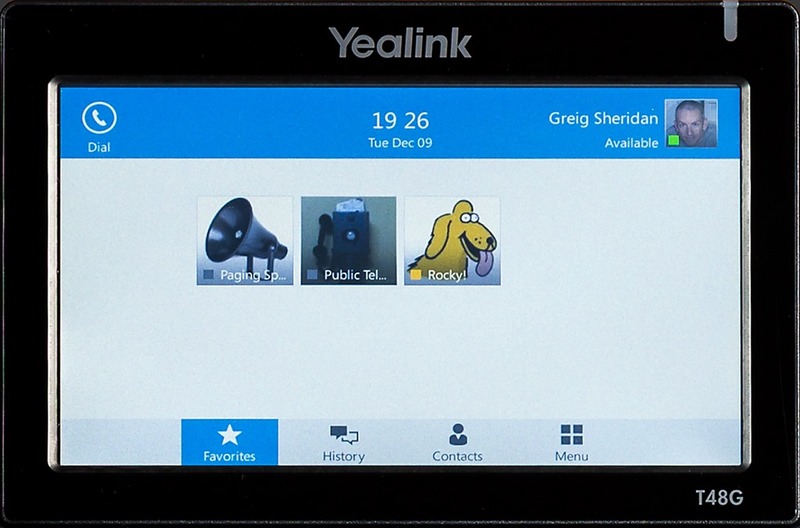 The former – a version of “Busy On Busy” when disabled – you can set from the phone, whilst the latter can only be enabled from the browser. My phone came running firmware 35.7.0.5 and I used the Lync “.cab” file provided to take it to 35.7.0.6. (Pat’s script loaded it into Lync without issue). Leaving the review overnight I awoke the next morning to see the phone asking “New firmware. Update now?” where I had expected it would have just happened automagically. With permission duly granted the process completed as hoped-for and it returned to the home screen, BToE still active. Unless I’ve missed something I’m guessing this is intended operation, so hopefully as the firmware matures we might see a fully automated update process. BTW with the separate “.rom” file you also have the option of a direct firmware upgrade on the phone itself. I didn’t do much more than peruse the 200+ page provisioning guide. 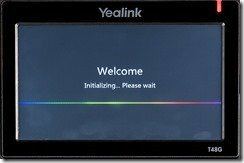 It explains the various means by which the phone will attempt to discover the provisioning server out of the box and walks you through the setup. The phone can be set to automatically check for configuration updates on a regular basis (daily/weekly/interval), or you can spike it remotely to force a reboot and check for new config. I was able to use the phone as soon as it powered up and accepted my PIN login – the default settings seem pretty-well spot-on (see ‘time’ below). I deliberately eschewed the user guide as much as possible and found it was quite intuitive to drive. The “Dynamic Forwarding” feature is pretty cute: If you don’t want to answer an incoming call, press the “sideways-U-turn” icon, then key or navigate your way through your Contacts or History to your intended recipient to redirect the call without the calling party realising! And any phone with a physical redial button always gets bonus points from me! 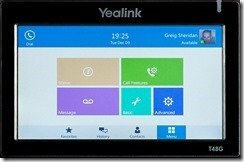 It’s clearly early days for Yealink and Lync, but the T48G is certainly an impressive showing for their first venture. OK, yes, I guess you’d want to be impressed by their top-of-the-line handset. The smattering of dodgy on-screen spelling and some of the other glitches noted above will surely be ironed out before too long. Being endowed with less than average levels of patience, I absolutely *love* that the T48G appears to be well-powered under the hood – the UI is *very* responsive. Whilst it has a big footprint, that’s needed to support the vast touch-screen, and it makes for a VERY easy to drive phone. Given it’s so big the physical buttons are well spread out, so you have no worries of bumping the wrong button. So far only the T48G and the much lesser T22 have been given the Lync firmware work-over. The chasm of difference between them may prove a stumbling block to early adoption by customers seeking to roll out a consistent phone look to those who still seek that comfort. Perhaps if some of the intermediate models also get a Lync firmware option the family’s appeal will grow. With formal Lync support (certification on the way apparently), BToE, Manager/Secretary features and a fast, easy to navigate UI, I think you could easily find the T48G sitting on the desks of your executives and their PAs. Just how far down the food chain they’ll trickle is the question, but if the lower models can perform at a similar level and Yealink’s serious about the Lync and Skype for Business market, we might have an interesting new player on the pitch. 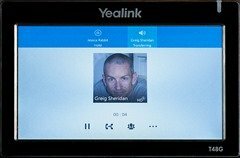 My review handset came courtesy of Yealink, and as always I have Rocky to thank for the photos (although I think the fingerprints on the screen are mine). Great article. I’ve been evaluating the various Lync phones BToE suites for suitability in a VDI/Citrix environment. 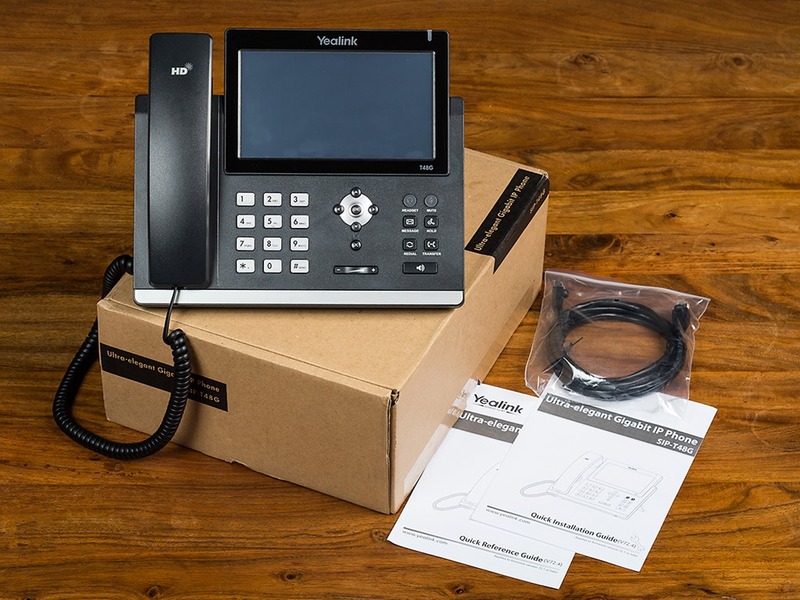 Unfortunately I’ve had confirmation from Polycom, SNOM and Audiocodes that their Lync IP phones and BtOE stack are not certified for use in a Citrix environment – seems to be a architectural constraint when remote controlling a phone from a common IP address as you’d expect in a Citrix environment. I notice with interest that you appear to be able to manually pair the BToE application with the phone by entering in an IP address, which may mitigate the issue. Any idea whether this would work in a RDS/Citrix environment? Sorry James, can’t help you with that one. AudioCodes Lync compatible phones support Citrix XenDesktop and VMWare Horizon with BToE. You can contact AudioCodes support for further details. Yes, but not in XenApp/RDS unfortunately (common IP). I have T48G and I was install new firmware 35.73.193.40, but I can’t login to phone using Lync phone number and PIN. You write what “With power applied we see a colourful splash screen for over a minute before it prompts for a login”, but I don’t have “prompts for a login”. May be need other firmware for work MS Lync?